We just expanded our Borneo adventure and wildlife tours—explore east, west, and central Kalimantan! Located in East Kalimantan, Mahakam is one of Borneo’s (Kalimantan’s) largest and most important wetland areas. Mahakam is home to a total of 90 bird species, including various herons and lesser adjutant, a wading bird in the stork family, and is a very important area for migrating and breeding bird species. This biodiverse wetlands is also home to endangered animals such as the crocodiles (Crocodylus siamensis and Tomistoma schlegeli), false gavial or gharial, proboscis monkeys, wild banteng (or tembadau, or jungle cattle/ox), and Irrawaddy dolphins. Read more about the Mahakam wetlands here. Your guide will meet you at the airport, then you will drive approximately six hours to Kota Bangun and check-in at your homestay. We will then travel by boat around the Semayang and Melintang Lakes, where we will try to spot fresh water dolphins, and will observe village life and beautiful sunset. Return to homestay. Includes lunch and dinner. We will travel across Jempang Lake to Mancong by motorized canoe, observing the various bird species, proboscis monkeys, monitor lizards, and other wildlife, and fishermen’s floating houses along the Ohong River, with lunch served en route. We will explore a local longhouse in Mancong, and experience Benuaq Dayak life. We will travel to Muara Muntai, where we will stay at a homestay and have dinner. Includes breakfast, lunch, and dinner. After breakfast, we will explore the exotic Muara Muntai village, and its long, iron wood bridge, which links all the roads in the hamlet. We will proceed to Kuyung to meet our car and driver, and then travel to Tenggarong town to explore the King Collection on the Museum of Mulawarman and Royal Cemetery of Kutai Kartanegara kingdom. After the museum, we will drive to Samarinda and overnight at the hotel. Includes breakfast, lunch, and dinner. We will have breakfast at the hotel, and then have leisure time prior to the airport transfer. Includes breakfast. Pristine and unspoilt Sangalaki Island in the Derawan Island archipelago is home to manta rays, sea turtles, corals, dolphins, and many other sea creatures. You can read more about Sangalaki and the Derawan Islands here. You will meet your guide at the airpot, then transfer to the hotel in Balikpapan to check-in, followed by free time. You will have breakfast at your hotel, then have some free time prior to your airport transfer and flight to Berau. Upon arrival in Berau town, you will drive approximately 2-1/2 hours, crossing mountains and rainforest, then transfer to a speed boat to the Derawan Island (approximately 20 minutes). After checking in at the lodge, you can enjoy a relaxing afternoon, diving/snorkeling around Derawan Island or exploring the daily life of the local villagers. We will have lunch en route, and have dinner and overnight at the lodge. Includes breakfast, lunch, and dinner. You will have breakfast at the lodge, then travel to Kakaban Island by boat, for diving and to explore the sea garden (with four species of jelly fish). Lunch will be served en route. We will travel back to the lodge, where we will have dinner and overnight. Includes breakfast, lunch, and dinner. You will have breakfast at the lodge, then travel to a dive site on Sangalaki Island called Capital of the Manta Rays. Here we hope to observe many exotic fish, including manta rays, napoleons, tunitates, purple sea horses, dwarf scorpion fish, and a fascinating coral sea garden. We will have lunch en route and enjoy some sightseeing on Sangalaki Island, then return to the lodge on Derawan Island for dinner and to overnight. Includes breakfast, lunch, and dinner. We will have breakfast at the lodge, then travel to the airport in Tanjung Batu for your flight to Balikpapan. We will have some free time until catching your flight to your next destination. Includes breakfast. 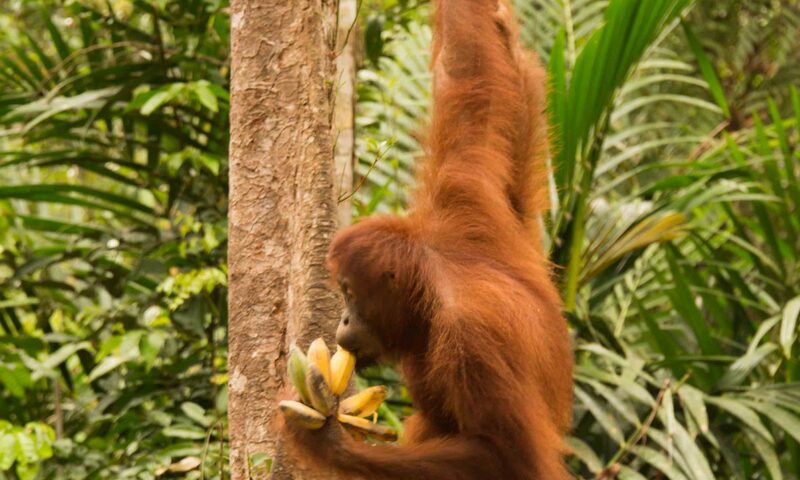 The Indonesia territory of Kalimantan, which makes up two-thirds of the island of Borneo, is well known as an international biodiversity hotspot, with incredible tropical forests and wildlife, including orangutans and gibbons. Kalimantan is complex, both geologically and topographically. It has the nine ecoregions (including eight land-based ecoregions, as well as the Sulawesi Sea). Four of these ecoregions are listed by the World Wildlife Federation as global ecoregions. Kalimantan has the largest expanse of intact lowland rainforest in Southeast Asia, and many moderately high mountain peaks (source: World Wildlife Federation, http://wwf.panda.org/who_we_are/wwf_offices/tanzania/?uProjectID=ID0169 [accessed August 13, 2017]). There are 394 species of freshwater fish, 290 species of reptiles, 288 species of terrestrial mammals, and 420 bird species. There are almost 11,000 species of flowering plants, including rare orchids and 12 species of rafflesia, the world’s largest flower. However, there is most likely even more diversity and is one of the most species-rich areas of the world: despite two centuries of taxonomic research, the islands’ species and conservation are still undocumented. It is estimated that 15-35% of the flora are yet to be collected (source: https://www.researchgate.net/publication/305323095_State_of_Kalimantan%27s_biodiversity [accessed August 13, 2017]). Peilahari Tanah Laut Wildlife Reserve is a forested part of Sultan Adam Forest Park (in Indonesian, Taman Hutan Raya Sultan Adam, abbreviated Tahura). Also known as Tahura Sultan Adam, it is located in the a forested area in Banjarmasin, in the Banjar regency of South Kalimantan province. The Pelaihari Reserve in Martapura covers an area of 36,400 hectares (almost 90,000 acres). Sultan Adam Forest Park is located approximately 55 kilometers from the city of Banjarmasin, or about 15 kilometers from the city of Banjar Baru, the capital of Banjar (source: http://www.indonesia-tourism.com/south-kalimantan/sultan_adam.html [accessed August 13, 2017]). Your guide will meet you at the Syamsudin Noor Airport (IATA: BDJ, ICAO: WAOO in Banjarmasin. We will then travel to Benua Raya swamp village to observe water buffalo, enjoy the romantic view of Meratus Mountains, and observe villagers’ activities in the stilt homes. We will then drive approximately thirty minutes to Pelaihari town, where we will stay overnight in a local hotel. We can also stop at the top of Kayangan Hill to view the beautiful Meratus Mountain range and romantic sunset overlook. Includes lunch and dinner, served at local restaurant en route. After breakfast, we will drive to Jorong subdistrict for our boat, where we will watch for crocodiles, langurs, proboscis monkeys, birds, and other animals. When we arrive at the beach, we will experience the fisherman’s daily activities, sunbathe, fish, and cook a fish barbeque together on the white, sandy beach. During the afternoon, we will return via a bucolic landscape of rice fields back to Banjarmasin, where we will check into our hotel. Includes breakfast, lunch, and dinner. We will leave for the floating market early in the morning, where we will experience the unique culture of the Banjarese who trade from boat to boat. We will then cross the Banjarmasin River to the hotel, while observing the riverside activity. We will then travel to Palangka Raya and check into our hotel. During the afternoon, we will visit Arboretum Nyaru Menteng and explore the endemic vegetation of the local peat swamp forest, and observe animals such as black leaf monkeys, monitor lizards, birds, and others. After the arboretum, we will travel to the Bukit Tangkiling Nature Reserve, where we will hike up the hill to enjoy the view of the plain and rivers, followed by a romantic sunset and return to the hotel. Includes breakfast, lunch, and dinner. After breakfast, we will travel to Tangkiling Port to connect with a motorized canoe, and continue to Orangutan Island, while watching the beautiful black river and rainforest for monkeys, birds, and other wildlife. Orangutan Island is managed by Borneo Orangutan Survival Foundation (BOSF), a nonprofit organization dedicated to the conservation of the Bornean orangutan and its habitat, and the islands at Nyaru Menteng, which are “the penultimate step in the rehabilitation of orphaned orangutans” (https://redapes.org/projects-partners/nyaru-menteng/). The name Orangutan Island is based on the Animal Planet series on Kaja Island, the first island acquired by BOSF, where the orangutans learn how to be independent in the forest school. If time allows it, we will travel onto Danau Rawet, where wild orangutans are sometimes seen. You will have some free time until your airport transfer. Includes breakfast. Your guide will meet you at the Syamsudin Noor Airport (IATA: BDJ, ICAO: WAOO in Banjarmasin, and we will travel to the hotel for check-in. During the afternoon, we will visit Arboretum Nyaru Menteng and explore the endemic vegetation of the local peat swamp forest, and observe animals such as black leaf monkeys, monitor lizards, birds, and others. After the arboretum, we will travel to the Bukit Tangkiling Nature Reserve, where we will hike up the hill to enjoy the view of the plain and rivers, followed by a romantic sunset and return to the hotel. Includes lunch and dinner. After breakfast, we will travel to Tangkiling Port to connect with a motorized canoe, and continue to Orangutan Island, while watching the beautiful black river and rainforest for monkeys, birds, and other wildlife. Orangutan Island is managed by Borneo Orangutan Survival Foundation (BOSF), a nonprofit organization dedicated to the conservation of the Bornean orangutan and its habitat, and the islands at Nyaru Menteng, which are “the penultimate step in the rehabilitation of orphaned orangutans” (https://redapes.org/projects-partners/nyaru-menteng/ [accessed August 14, 2017]). The name Orangutan Island is based on the Animal Planet series on Kaja Island, the first island acquired by BOSF, where the orangutans learn how to be independent in the forest school. If time allows it, we will travel onto Danau Rawet, where wild orangutans are sometimes seen. We will then travel across lowland forest and peat swamps back to Banjarmasin. Includes breakfast, lunch, and dinner. We will leave for the floating market early in the morning, where we will experience the unique culture of the Banjarese, who trade from boat to boat. We will then cross the Banjarmasin River to the hotel, while observing the riverside activity. We will then drive approximately three hours to Kintap town, crossing the beautiful Meratus Mountains. We will enjoy lunch en route, then have dinner and stay overnight in Kintap town. Includes breakfast, lunch, and dinner. After breakfast, we will take a boat up the Asam River, and watch for crocodiles, proboscis monkeys, birds, langurs, and other animals. We will then travel to Pagatan Beach and stay overnight at a local beach cottage. We will enjoy lunch en route, and have dinner and overnight at the Pagatan Beach cottage. Includes breakfast, lunch, and dinner. After breakfast, we will drive to Goa Liang Kalih and trek underground to explore the stunning stalagmites and stalactites of this limestone cave. We will then travel to Sungai Durian to explore the limestone karst en route. We will continue onto Kotabaru and check-in to our hotel. We will have lunch en route and have dinner at our hotel. Includes breakfast, lunch, and dinner. We will have breakfast at the hotel, then have some free time before your airport transfer and departure from Gusti Syamsir Alam Airport, commonly known as Stagen Airport (IATA: KBU, ICAO: WAOK formerly WRBK) in Kotabaru. Includes breakfast. Your guide will meet you at the Syamsudin Noor Airport (IATA: BDJ, ICAO: WAOO in Banjarmasin, and we will travel to Sungai Rutas village to take a boat cruise upriver and watch for long-tailed macaque, silver langurs, proboscis monkeys, monitor lizards, birds, and other wildlife, as well as observe the daily activities of the local people. After the boat trip, we will drive across swampy and lowland landscape to Loksado into the Meratus Mountain plateau. We will have lunch en route, and have dinner and overnight at a lodge in Loksado. Includes lunch and dinner. We will trek through the jungle and Dayak tribal areas, crossing primary and secondary rainforest, waterfalls, bamboo bridges, village farms, longhouses, rivers, and farms of cinnamon and rubber trees. In the afternoon, we will hike back to the lodge along another travel, and enjoy another route through nature. We will have lunch en route, and have dinner and overnight at the lodge. Includes breakfast, lunch, and dinner. After breakfast, we will travel by bamboo raft across Amandit River rainforest. Our coach will meet us downstream and drive us to Pagatan Beach for an overnight stay at a beach cottage. We will enjoy lunch en route, and have dinner and overnight at the Pagatan Beach cottage. Includes breakfast, lunch, and dinner. Enjoy breakfast and the morning at the beach resort. We will then drive to the Asam River for our boat trip upriver to spot proboscis monkeys, crocodiles, birds, silver langurs, and other animals. We will then transfer to our hotel in Banjarmasin. Includes breakfast, lunch, and dinner. We will leave for the floating market early in the morning, where we will experience the unique culture of the Banjarese, who trade from boat to boat. We will then cross the Banjarmasin River to the hotel, while observing the riverside activity. We will then travel to Palangka Raya and check into our hotel. During the afternoon, we will visit Arboretum Nyaru Menteng and explore the endemic vegetation of the local peat swamp forest, and observe animals such as black leaf monkeys, monitor lizards, birds, and others. After the arboretum, we will travel to the Bukit Tangkiling Nature Reserve, where we will hike up the hill to enjoy the view of the plain and rivers, followed by a romantic sunset and return to the hotel. Includes breakfast, lunch, and dinner. After breakfast, we will travel to Tangkiling Port to connect with a motorized canoe, and continue to Orangutan Island, while watching the beautiful black river and rainforest for monkeys, birds, and other wildlife. Orangutan Island is managed by Borneo Orangutan Survival Foundation (BOSF), a nonprofit organization dedicated to the conservation of the Bornean orangutan and its habitat, and the islands at Nyaru Menteng, which are “the penultimate step in the rehabilitation of orphaned orangutans” (source: https://redapes.org/projects-partners/nyaru-menteng/ [accessed August 14, 2017). The name Orangutan Island is based on the Animal Planet series on Kaja Island, the first island acquired by BOSF, where the orangutans learn how to be independent in the forest school. After breakfast, we will travel by bamboo raft across Amandit River rainforest. Our coach will meet us downstream, and we will drive to Banjarmasin to overnight at a hotel. Includes breakfast, lunch, and dinner. We will then travel across peat swamp forests into Kereng Pakahi Port, where we will cross the Katingan River, while watching for kingfishers, hornbills, long-tailed maccaques, proboscis monkeys, and other wildlife. We will then trek to our homestay in Sabangau National Park, where there are over 25 species of mammals and over 6,000 wild orangutans, and is home to the world’s largest population of orangutans. We will trek via Punggu Alas Creek; if the creek is dry, it will take us about 1-1/2 hours of walking to reach the homestay at the World Wildlife Federation (WWF) Sabangau Research Centre. The centre tracks the activities of the animals sighted, including orangutans, gibbons, honey bears, and proboscis monkeys, and hires local villagers as rangers, and trains them to track migratory wildlife, input data, and other activities. In the evening, we will take a boat trip and watch for nocturnal animals. Includes breakfast, lunch, and dinner. We will enjoy breakfast by the creek, and will then go on a ranger-led trek in the jungle to explore the flora and fauna. We hope to see orangutans, monkeys, birds, endemic vegetation, and other wildlife (but sightings are not guaranteed). We will return to the camp for lunch, check out of the homestay, and travel to our guesthouse at Lake Bulat. The lake’s reddish brown color comes from the peat swamp, and the area is home to monkeys, fruit bats, macaques, and a variety of water birds and fish. Includes breakfast, lunch, and dinner. After breakfast at the guesthouse, we will travel to Palangka Raya to your hotel, or the airport for an afternoon flight to your next destination. Includes breakfast.